Let’s face it – there are so many yoga brands these days – it’s really difficult to keep up! Yet, not all yoga businesses are made equal. Some have been around for a long time, and hence have become true giants, while others are new, just starting up, and struggling to get their voices truly heard. 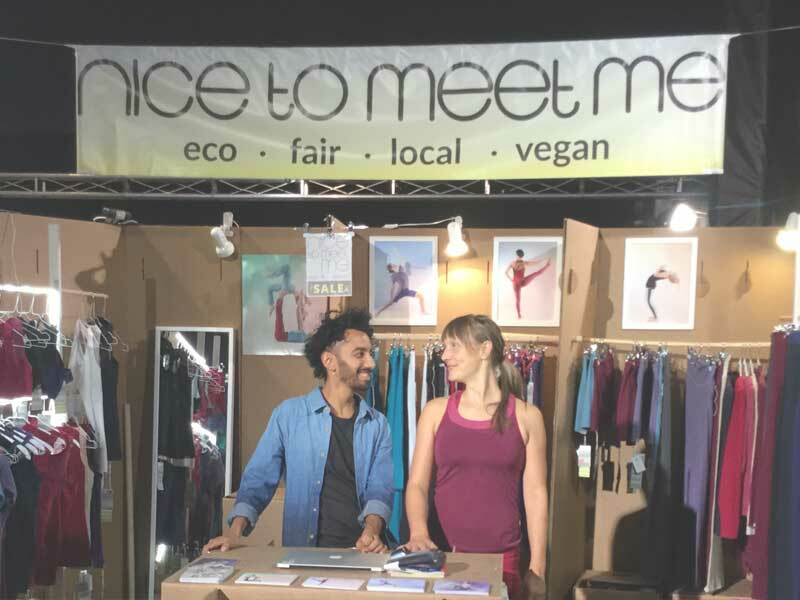 Nice to meet me is a small eco yoga clothing brand from Austria, ran by two people in love with each other, yoga, fashion, and the planet. 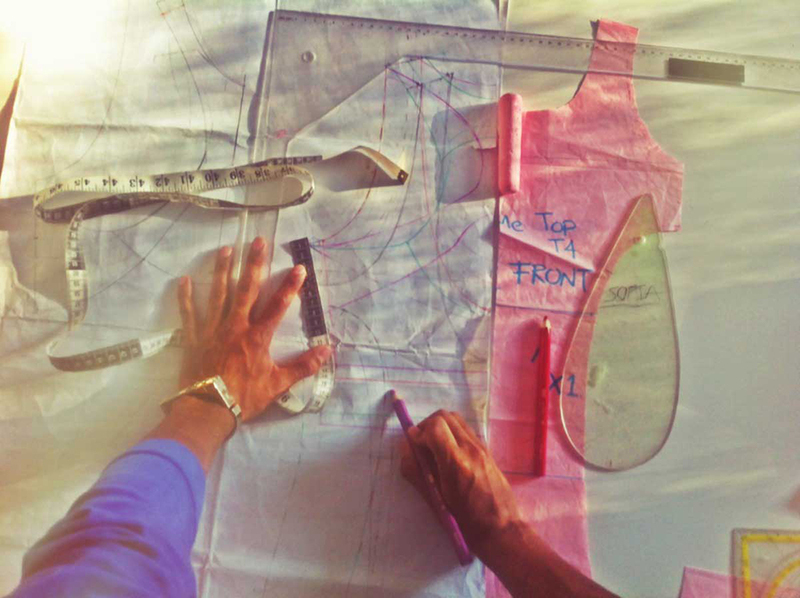 Every step along the way – from envisioning an outfit to making it, from producing it to marketing it, and from communicating about it to shipping it – is made with love, respect, and consideration. Denise and Maicol are based next to Vienna and also run a small yoga shala. The company was born naturally out of their talents, passions, values, and visions put together. Aside from making clothing ethically and making them truly high-quality and beautiful as the result, they are passionate about teaching yoga and living and sharing the yogic way with others. Q: Every great story has a great beginning. How did the story of Nice to meet me start? A: Actually, the beginning was in Bogotá, when Maicol and I met for the first time. Later, when we settled in Vienna, I became a yoga teacher, while Maicol, who already worked as fashion designer since he was 15 years old, running his own brand in Colombia, started to design yoga pants for our own practice. It all came together naturally and the whole project started to grow slowly. Since then, the company have developed “organically” – there was never a very exact business plan – for us it’s always been a process of learning by doing and the business has grown just as fast as we could grow within. 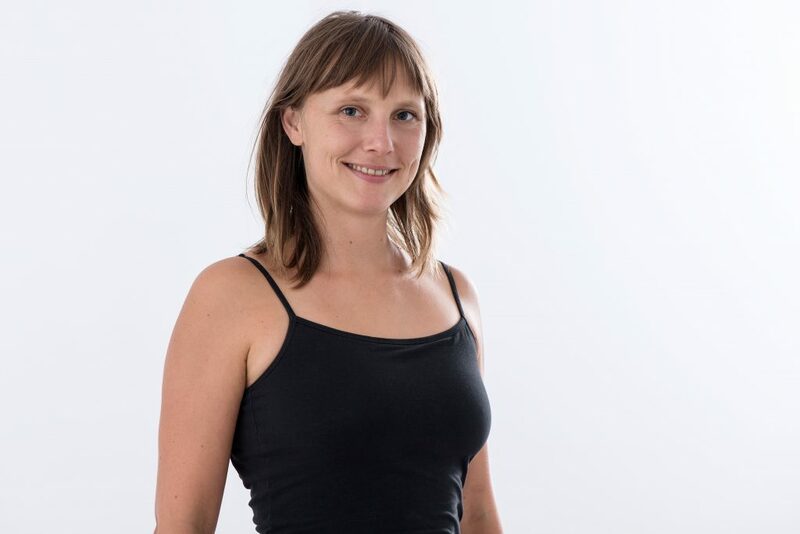 Q: What are the main principles and values behind Nice to meet me, from the production processes, through treating the workers, to the way the company choses its models and approaches the issue of body image in yoga? A: The core of the concept comes out from our understanding of Yogic philosophy. While we create products, we need to take care of not doing any harm to the planet and people involved in the production. Ahimsa – non-harming – leads us through the decision making process. This is not always easy for a small company – as the conservative options are cheaper and more accessible. When it comes to production tasks like cutting, sewing and packing of the clothing, we do those only in European countries, close to Austria. This allows us to personally visit the factories and keep close contact with them. Besides, we choose smaller companies, to enable more impact on how our clothing is produced. The farer away and bigger the factory is, the harder the personal contact is. In this case, we’d need to work with agents to intermediate the process. Regarding the materials we source only from Europa. When it comes to natural fibres – we use only organic cotton and the very sustainable TENCEL® fibre, that comes from an Austrian Company. Since sportswear also needs more functional materials, we use recycled polyester from PET bottles and recycled Polyamide from fishing nets. The dying and printing is non-toxic and we really care about efficient and short transports. All packaging is made of compostable “plastic” from natural sources or recycled paper. The question about the body image is right now very controversial in the yoga world. Social media suggests that doing some advanced poses with a very flexible and skinny body makes you a good yogi. We don’t think so. Instead, we know that the practice of yoga lets us grow internally and this influences how we think and act as humans. We are concerned to not reinforce this “perfect yoga body” image and to show that yoga, as well as our clothing is for every body. Q: It seems that these days it is quite challenging to manage a yoga business: there is so much offer, so many possibilities. How do you cut through all the noise and manage to find your customers? A: I would say: Authenticity. We love to be inspired by many different things. As Maicol is very passionate about fashion and I come from the yoga world we know how to blend great style with functionality. Our customers appreciate our efforts and the way we live our values within the company. They feel good buying and wearing the stuff. Also I am sure that people value the effort of small sustainable companies more and more, knowing that buying from those businesses will shape the future of our planet. Q: Do you find it sometimes difficult to balance business and yoga, as well as professional and personal lives? A: I find it difficult to divide these areas. The yoga draws through every aspect of my life! As we earn our money from yoga (we run a yoga studio and the label nice to meet me), I find it challenging to balance between doing business out of yoga and still walking the path as a yogi, besides making the effort for a meaningful contribution with this business. As long as I give the best and I give it from my heart, with joy, there has to be no division between personal life and work, taking these apart would feel unnaturally to me. Q: What is the most gratifying aspect behind your work, and what do you find very challenging? A: I am a kind of introverted person, but community is very important for me. At the yoga studio, the relationship with the people who come to practice gets deeper and more personal over time. 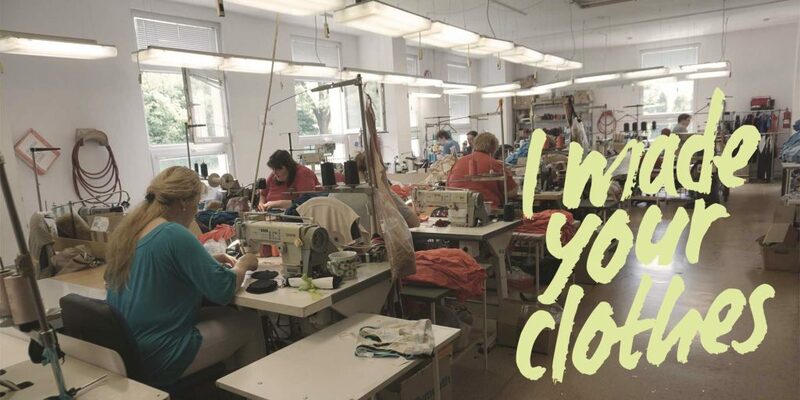 Via our clothes brand, we are able to share our messages and communicate with many people over the internet and trough the clothing. I am very grateful for our community: a small and intimate one at the studio and a very broad one, we’ve build online through nice to meet me. To work on our own projects and doing what you really love brings joy and contentment. It’s definitely worth all the extra hours we are working. The most challenging task for our company is to remain sustainable and true to our values. The fashion business requires to be faster and grow bigger, to produce every time more. If you want to make big money, you have to produce really big and cheap. If you want to produce conscious and respectful, the way you go is very hard, but the process and the outcome are much more beautiful. Q: What is success in your opinion, and what advice about success in the yoga world would you give to the following people: a yogi, a yoga teacher, a yoga business owner? Success is not so easy measurable, especially as yogi and yoga teacher. It doesn’t come linear as a yogi and it might not show itself as we expect. When teaching yoga, we learn that is not so much about our self. The success might reflect itself more in the progress of our students, than in ourself. But running a yoga business, also as a teacher, we do have to work sustainable and take care to survive: applying our values, while valuing our work. Stay true to yourself, look closely and allow your mind and heart to remain opened. This is my advice to us as yogis, teachers and business owners. For the yogi it is so important to stay opened and interested in the practice. To keep the closer look on what is it all about. Behind all forms that we practice, we look deep inside, questioning who we really are, loosening up the patterns that shape our mind and our behaviour. In the end, we practice to be a better, kinder and more conscious human being. Same for the teacher: We pay attention to what is needed to serve our students, without superimposing our ideas on the studying yogi. We practice and study a lot and teach from our experience as much as we teach from our heart. We try do not get stuck in fixed ideas or dogmas, staying open and allow ourself to change our mind. To the business owner: more of all those mentioned above. We carry a huge responsibility, as our decisions may have more impact on the ecosystem and more influence on the people. So, we work on staying true to the values we really believe in. Keep our mind opened and flexible to find ways for swimming against the stream. Instead of trying to make more money and grow faster, we explore ways of valuable contribution to the world and make it better to live in.